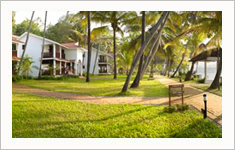 The resort offers a total of twenty five rooms, spread across five chalets.This includes three suites. All rooms are furnished, air conditioning, tea coffee making facility, mini refrigerator and wall mounted LCD Televisions with DVD players. From every room you have a beautiful view over the garden and the lake. .
HOUSE BOATS: Catamarans provide an opportunity for exhilarating watersports. 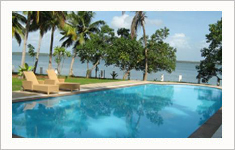 With a gentle breeze to aid, one may sail around the Ashtamudi Lake. For non-sailors, there are enormous possibilities. 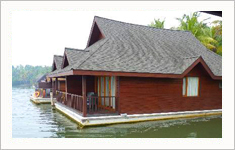 One may rent a boat to see the surroundings of the resort from the waterside. A special variety is a trip with the well and comfortably equipped Ashtamudi houseboat, which can be rented for short or long journey. 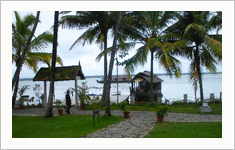 RESTAURANT: The restaurant is built in an imaginative manner on the shore of the Ashtamudi Lake, providing a marvelous view. The well-equipped kitchen is located in a separate building. Cooks prepare culinary specialties to the guest’s wishes. The main food will be of the ethnic Kerala origin. The wide variety of preparations both vegetarian and non-vegetarian are available to please the gourmet. There is also a wide choice of other Indian, Chinese and continental specialties. An exceptionally tasty dish is fish freshly caught from the lake and prepared. 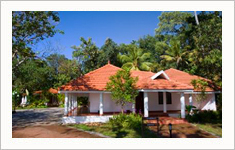 There are specially trained cooks to prepare tasty Ayurvedic recipes. ROOMS: The twenty spacious rooms in five chalets are all built in aesthetic traditional and eco - friendly methods. They are comfortable, with separate toilet and shower room in the western style. Two big suites are in the two Queens Cottages. On special request you can book the exclusive, luxurious king's palace. 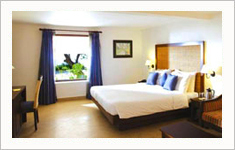 All rooms are furnished with fan and low noise air conditioning. From every room you have a beautiful view over the garden and the lake. 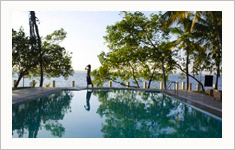 The restaurant is built in an imaginative manner on the shore of the Ashtamudi Lake , providing a marvelous view. Chefs prepare culinary specialties to the guest's wishes. The main food will be of the multi-cuisine and ethinic Kerala origin. The wide variety of preparations both vegetarian and non-vegetarian are available to please the gourmet. There is also a wide choice of other Indian, Chinese and continental specialties. There are specially trained chefs to prepare tasty Ayurvedic recipes. 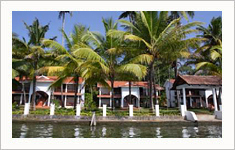 www.kerala.com www.quilon.com www.keralatravels.com Powered By Worldviewer Dot Com (India) Pvt. Ltd.